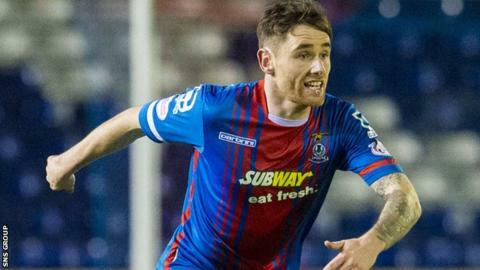 Manager Derek McInnes is "surprised and disappointed" that Aberdeen's bid for Greg Tansey was rejected by Inverness. The Dons thought they had triggered a release clause for the 27-year-old midfielder with a £200,000 offer. "Greg's agent told us about the clause weeks ago and we met that clause," explained McInnes. "It's unclear why he's not here and we feel he should be. We understand their desire to keep him but we are surprised that clause wasn't met." The Highlanders are thought to have argued that the wording of the clause in Tansey's contract was ambiguous. McInnes said that he had discussed the issue with his opposite number at Caley Thistle, John Hughes. "We acted professionally and with integrity," he said. "John agrees with that, he has no problem with that. "The only thing we are maybe guilty of is maybe not going in a bit earlier. "When I found out on Friday that we could make the offer, it was my call not to disrupt their preparations for Saturday and when their game was called off in the morning that's when we put the bid in. "£200,000 isn't easy for us to put together. I had to try and generate that through bits and pieces. "We thought the offer would have triggered a clause in the player's contract that would allow him to be here." McInnes did manage to add to his squad, with the deadline day signing of Wales striker Simon Church, on loan from MK Dons. "In light of the injuries to Ryan Jack and Willo Flood, we targeted two players - a midfielder and a different option at centre forward. "We got one, we didn't get the other. "Simon brings real pedigree and he has a great enthusiasm to be here. "He's a real team player, he works extremely hard and likes to put himself about. If we get good service into, he'll enjoy his time here. "There were lots of names being thrown at us but I thought the two players we were after could come in and really help us now. "You don't always get what you want and we may need to find out more about some of the youngsters before the end of the season."